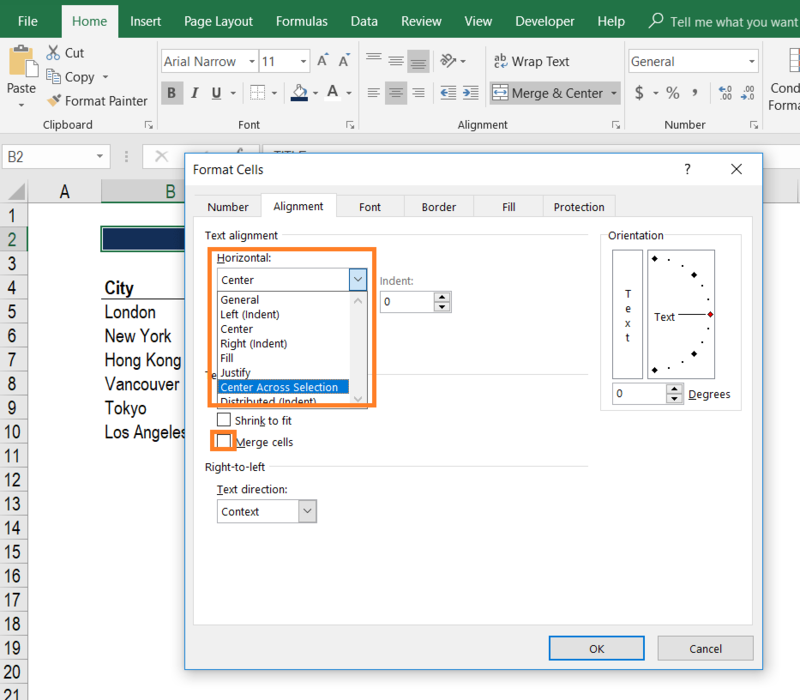 The most common reason to merge cells is for formattingExcel Modeling Best PracticesThe following excel modeling best practices allow the user to provide the cleanest and most user-friendly modeling experience. Microsoft Excel is an extremely robust tool. Learning to become an Excel power user is almost mandatory for those in the fields of investment banking, corporate finance, and private equity. and centering headings. 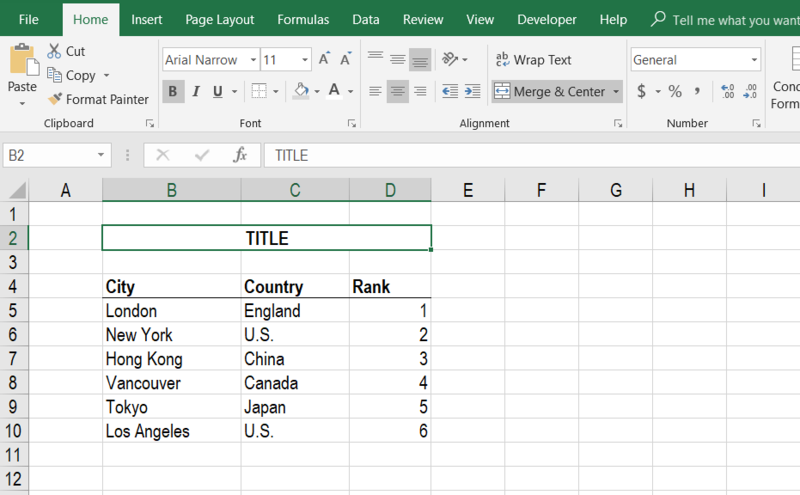 This guide will show you how to merge cells in ExcelExcel ResourcesLearn Excel online with 100's of free Excel tutorials, resources, guides, cheat sheets, and more! CFI's Excel resources are the best way to learn Excel on your own terms. These guides and articles teach spreadsheet formulas, shortcuts, and functions step-by-step with screenshots, templates, lessons, guides, and more, even though it is highly recommended that you don’t merge them unless you absolutely need to. As an alternative, we recommend using the Center Across Selection feature. Learn with video instruction in CFI’s Free Excel Crash Course! 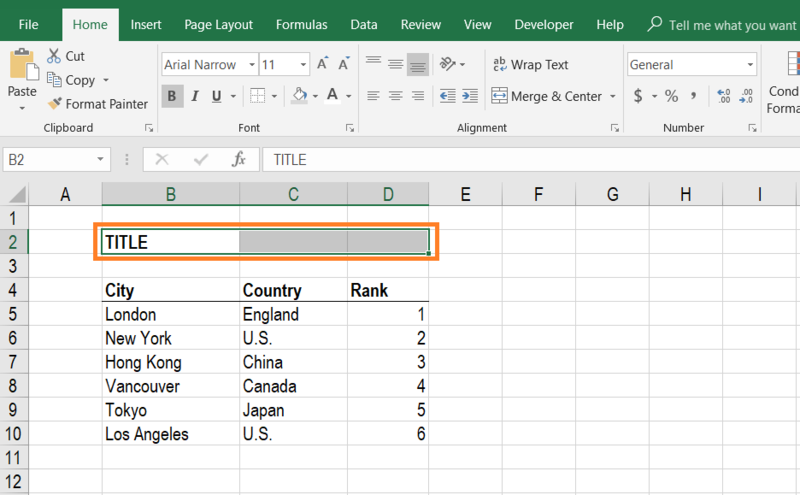 Follow the steps below to learn how to easily combine multiple cells in an Excel spreadsheet. Use the screenshots as a guide and then try it on your own! Select the cells you want to merge. Highlight them with your mouse or by starting in one cell, holding Shift, then using the arrows to select to the end. On the Home Ribbon, select the Format Cells button, or press the keyboard shortcutExcel Shortcuts PC MacExcel Shortcuts - List of the most important & common MS Excel shortcuts for PC & Mac users, finance, accounting professions. Keyboard shortcuts speed up your modeling skills and save time. Learn editing, formatting, navigation, ribbon, paste special, data manipulation, formula and cell editing, and other shortucts Ctrl + 1 to open the Format Cells dialogue box. 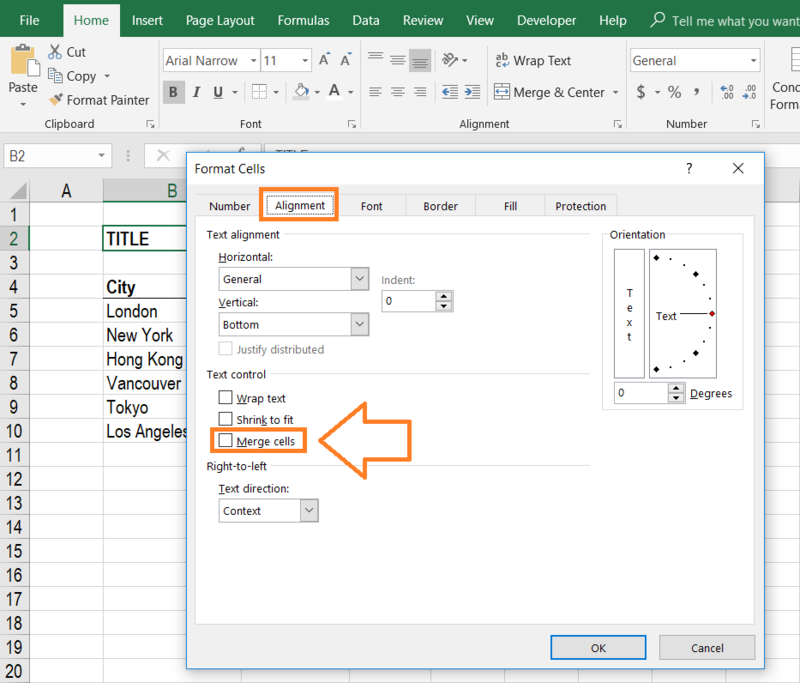 Inside the Format Cells menu, click on the Alignment tab and tick the box that says Merge Cells. Learn step-by-step in CFI’s Free Excel Crash Course! 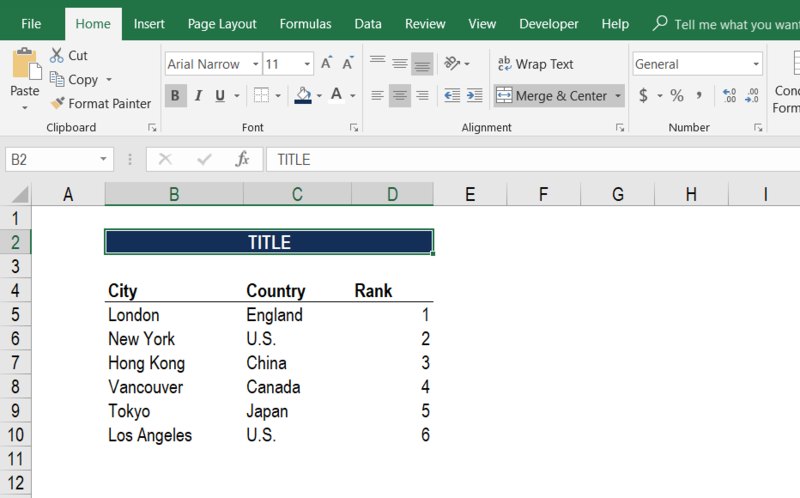 Click center to place the title in the center of the merged cells and set a background color to make the title really stand out. Merging cells is not recommended because it interferes with actions you may wish to take later while building your financial modelWhat is Financial ModelingFinancial modeling is performed in Excel to forecast a company's financial performance. Overview of what is financial modeling, how & why to build a model. A 3 statement model links income statement, balance sheet, and cash flow statement. More advanced types of financial models are built for valuation, plannnig, and. For example, if you want to insert or delete columns across the middle of merged cells, you will not be able to. You can achieve the same formatting outcome as merging cells by using the Center Across Selection function. Follow the steps below to perform the action yourself. Select the cells you want to center using the mouse or holding the Shift key and using the keyboard arrows. Open the Format Cells dialogue box on the Home Ribbon, or by pressing Ctrl + 1 (Windows shortcut, see the Mac equivalent shortcut). Now click on the Alignment tab and then choose Center Across Selection. Note: be sure to uncheck Merge Cells if it’s already checked. Congratulations! You now have nicely centered text without combining cells. Data ValidationData ValidationData validation in Excel is an existing and accessible tool to ensure data integrity while building a financial model. Although it is only an easy extra step, data validation in Excel is an extremely useful tool to secure your model inputs and outputs.